Volkswagen needs a bit more luxury and, with the less than stellar performance by the Phaeton, you may be looking at it. Chris Doane, our intrepid photographer, managed to grab views from the floor of this new sleek coupe. 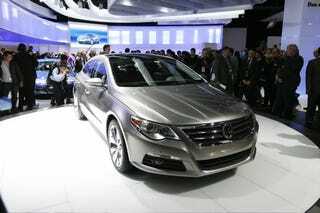 Getting the jump on Ford, VW will be offering the Passat CC exclusively with direct injection engines "worldwide." That means the US will be getting a 200 horsepower 2.0 liter TSI and 280 horsepower V6 FSI. All of the V6's will be offered with full-time 4MOTION all-wheel drive as standard equipment.